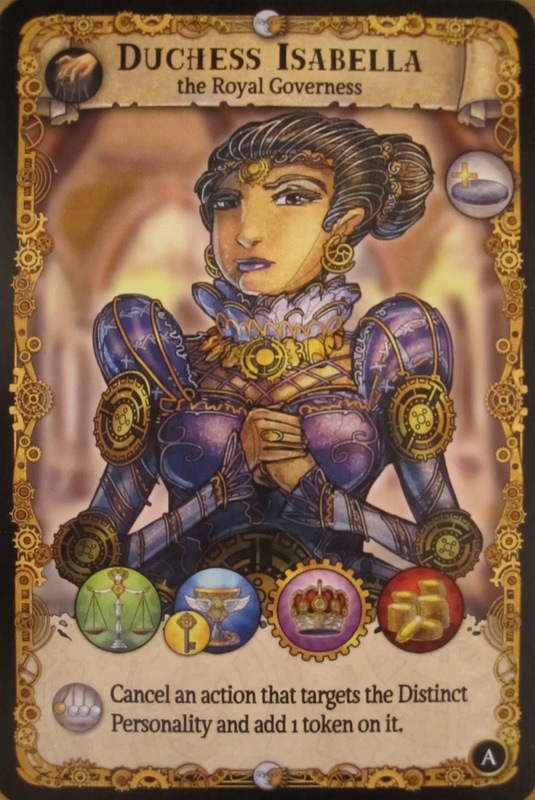 "Shadows Over the Empire" the latest from Artipia Games, recently landed on doorsteps across the United States. With amazing artwork, a politically intriguing storyline, and a varying use of the modular area control / area influence card mechanic, I fell in love with the project via its Kickstarter campaign and found that I had to pledge. After about a month delay, it finally landed on my doorstep around the new year and I cracked it open to play with friends within a week thereafter. This is a collection of our first impressions of the game. Game Setup? : "Umm... this looks complicated"
Game Play? : " . . . "
Confused yet? Well so were we. For three strategically minded individuals, "Shadows Over the Empire" took a lot longer to comprehend than we thought it should have. The overall consensus? The game instruction manual lacked some clarity. Then again, we enjoyed the game in the end, so what happened? The premise of the game is to use your leader to "influence" other members of society in hopes of influencing a distinct personality (in the case of the beginner version "A" this would be the Heir to the throne). 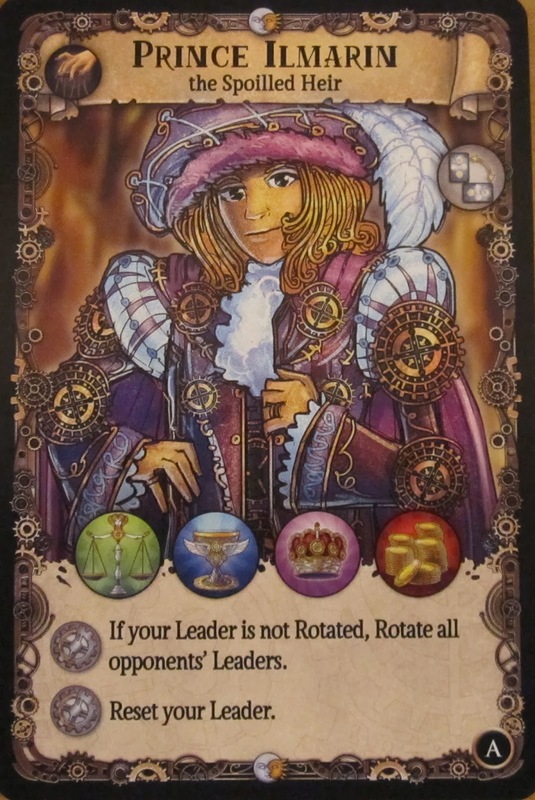 During Game Play there are anywhere between two to four “Leaders” from four different factions, vying to influence the central leader of the land also known as the “Distinct Personality”. During each round, one player can use a card that is in their "control" and use it to "influence" another card adjacent to said card. Once a player decides who to use to influence whichever card, both cards can no longer be used to influence other cards until the round is complete. 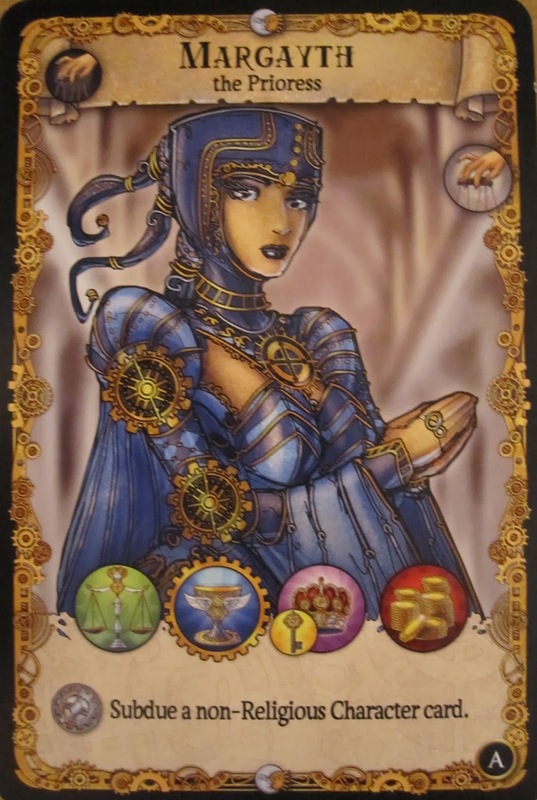 However should two players decide to exert their “influence” onto the same character card, that card is no longer considered as being in “control” by any one player and is considered as being in “conflict”. The key with having a character in “conflict” is that it negates one of the “win conditions”… but more on that later. Instead of trying to expand their “influence” a player may choose to use an ability of a character card that is in their “control”. Once used, the character card's ability can not be used again until the round is complete. - - Use: performed during a player’s turn, once used the corresponding character card must be rotated 90 degrees. "Subdue: Several cards allow a player to subdue a Character card. Subdue is similar to Influence with the difference that even Diverging Character cards may be targeted." So not only could a card influence other cards adjacent to it... it could also subdue them? But is subduing only good for adjacent cards or for any card on the board? Take that a step further and a few character cards could also "subdue" as part of the character card ability... so how to differentiate "subdue" in terms of "influence" versus "subdue" in terms of character card ability? The truth is that, after reading through the manual, we didn’t know. There was no clarification or information to help understand more about this "subdue" ability that some characters have but others do not. If you take away the "subdue" ability and everything was fairly straightforward. We had fun creating "conflict" among characters where "conflict" occurs when one more than one faction holds "influence" over a card. There were times when one player would try to "influence" a character... but another player would automatically "cancel" said action, preventing "influence" to occur. After a few rounds of gameplay the idea of political intrigue and attempting to gain "control" over characters become rather fascinating... and this was while only using the "A" cards (A = beginner, B = intermediate, C = expert). All that aside, the general consensus is that the game can be fun to play, if a bit much on the learning curve for some people. It does take a bit of patience and commitment to play in order to fully understand and enjoy. This is not a game for just anyone and not everyone is going to enjoy this game. However, if you can keep an open mind and just play to enjoy the game and for the most part one would find this to be rather fun. Granted, this might not happen for a few games, when you're trying to get your feet wet, but with time you'll probably get there. Marianya is in the running for a spot in the "jack of all trades" club. By day she is an electrical engineer, by night the sky's the limit. You can find her on Twitter at @marianya or learn more about her at her website: Dancing Through the Universe.